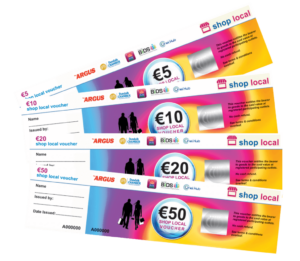 Dundalk Chamber of Commerce “Shop Local Gift Vouchers” are the perfect all year round gift idea and are not just for Christmas. This gives you the opportunity to treat family and friends while allowing them the freedom to choose where to spend the voucher. Vouchers are perfect for all sorts of occasions such as Birthdays, Communions, Anniversaries or as a simple “Thank You” to that someone special. Please ensure you have read the Terms & Conditions.